HP today announced the HP Z8 G4, the most powerful workstation on the planet1 and security features that denote HP as having the world’s most secure and manageable desktop workstations2. The reinvention of HP’s most powerful desktop PCs meets the compute power needs demanded by the world’s inventors of change, including product designers, architects, digital creators, scientists, educators, healthcare workers, financial traders and others. The HP Z8, Z6 and Z4 Desktop Workstations are equipped with extreme power, unprecedented security2and innovative design, future-proofed to support the fast growing fields of virtual reality, machine learning and advanced design. HP Z8 Workstation is scheduled for availability in October starting at $2,439. HP Z6 Workstation is scheduled for availability in October starting at $1,919. HP Z4 Workstation is scheduled for availability in November starting at $1,239. 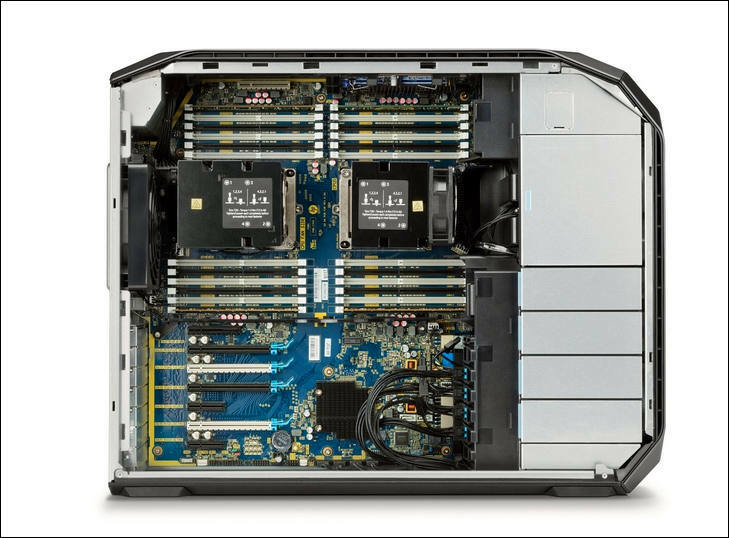 "HP Z8 Workstation has the capability to run the most complex simulations and process massive amounts of data. Users can run 3D simulations and edit 8K video in real time"
Total BS press hype about "8K video editing in realtime", and it has no thunderbolt 3 onboard... without option! Also Thunderbolt has NOTHING to do with 8K video for desktops, as you can just have simple SSD trays. You need PCI-E 4.0 for? Especially in the age of all simple filters and LUTs being done in GPU memory. For realtime HEVC 8K editing (if software will keep up) all you need is NVidia GPU now. For raw I suggest to check http://www.personal-view.com/talks/discussion/15474/advanced-dng-player-for-cuda#Item_2 this guys make outstanding optimized software. PCIe NVME SSD arrays are already bandwidth limited and require PCIE 4.0 bandwidth going forward ASAP. PCIe NVME SSD arrays require PCIE4.0 bandwidth, and already saturate the PCIE 3.0 bus. Fastest SSDs just are PCI-E cards and use many PCI-E lines (up to x16). With dual server CPUs it must have pretty enough lines (I see 4 PCI-E x16 slots). I am amused by such a powerful workstation that treats a 40Gbps interface as less important than a 10Gbps interface in 2017 going into 2018. 8K 14bit completely uncompressed raw at 30 fps require 1.7GB/sec read speed, OK for good affordable, not top NVMe SSD. In reality for any not top studio work it'll be 1:8 compression and 12bit raw at 24fps most of the time, and it is 150MB/sec, any cheap SSD works perfect. 90% of people will work with affordable cameras produced 200-600Mbit HEVC 10bit footage. Regardless, even Thunderbolt 3 is not fast enough for working with multiple uncompressed 8K streams in realtime. Where are "multiple uncompressed 8K streams in realtime"? Multicamera 8K production that even not top companies use now? Who exactly work with 8K uncompressed footage? What for? It is some pure fantasies. You mean some capitalists wild dreams? 8K 120fps will be just marketing line. As this guys for now are barely able to provide 4K 24-30fps with extreme compression. And 8K has extreme high chance to share destiny with DVD-Audio. Again, I am completely lost on your logic. As you somehow managed to judge real product with imaginary tasks and non existing future standards. With real Red 8K raw this thing will fly. Which cameras that are shipping now or in the near future shoot 8K uncompressed raw at 120 fps? The highest-end RED cameras seem to do about 60 fps at 8K or 75 fps at 8K 2.4:1 and to do that, they do 12:1 compression for a data rate of 270 megabytes per second (just a bit over 2 gigabits per second). Thunderbolt 1 should be able to handle 3-4 streams of that just fine. So, I'm not sure why you'd have a problem with a computer which is shipping in the near future can't keep up with the data rate for cameras that won't be available any time in the near future which record to high speed media which hasn't been invented yet. The computer seems more than capable of editing the footage that any currently-shipping 8K camera can produce. Do not worry, it won't be any "broadcast standard" at least 10 years. Not because cameras or sensors, but because of simple distribution limits and fact that upping resolution actually do not bring even one dollar for income of distribution networks. I don't see that the Thunderbolt issue is relevant; HP will come out with something, but you certainly don't need it for loading. If capturing on a large disk, I can always just load it directly in any number of ways. But it's in the specs as a forthcoming option, so the issue is moot. As far as editing 8K and obsolescence of the PCI bus, and so on, HP generally speaking makes pretty well designed desktops that are modular. So there is no obsolescence, if you want a different part you can just swap it out. All computers, laptops, tablets and so should be made with a degree of upgrade modularity. If the CPU is soldered on, obviously don't buy it. I've worked on a number of HP designs, and they are often quite innovative. The i7 water cooled tower still is cutting edge. As far as 8K being the standard of the future, it pretty much is a crap shoot right now as far as standards; my guess is that the Internet will be the standard, not the broadcast, and the viewer will be able to select a resolution from the little gear. I can't see this changing. The previous gen z840 will be on discount now. That is where the bargain will be.